Tile a kitchen backsplash or bathroom surfaces with the glass and stone combination of Splashbacks 6 in. x 6 in. 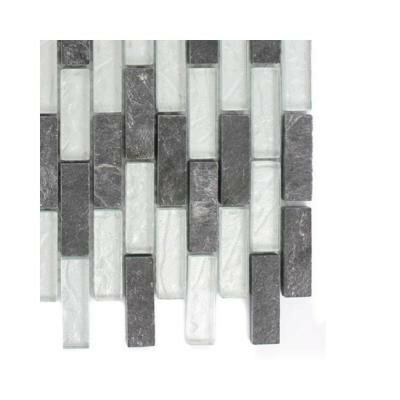 Sample Size Tectonic Brick Black Slate And Silver Glass Tiles. Create a beautifully multi-dimensionally effect with this unique tile design. The mesh backing not only simplifies installation, it also allows the tiles to be separated which adds to their design flexibility. See item 203478067 for full size tile. You can buy this product in our internet market. We will be glad if you make the right choice. Your design can affect the amount of fine detail, it is better to buy a 5-10 percent more goods that would eliminate the shortage of materials.